SugarSync Online Backup Service is a full featured online storage solution that obviously, by its name, tries to be the best at synchronizing your data among an unlimited amount of devices. Sugarsync wants people to have their data backed up, but also have great access to that data however they want to use it. While data plans are priced according to how much storage you need and not unlimited, other features are designed to lure you with convenience and access. All data that is backed up to SugarSync servers is geographically distributed and secure, but Photos are actually treated special in that they are automatically arranged into photo albums that make it easy for you to view from anywhere and share with others should you choose to. There are a number of backup plans with varying options that make SugarSync a great choice for online backup, storage and sharing for both home and business users. As for client operating systems supported, SugarSync supports all modern versions of Mac OS and all Windows versions. Linux users are out of luck but with Mobile users they hit a home run. Mobile versions of the SugarSync software support the iPhone, Android, BlackBerry, Windows Mobile and Symbian. They are probably the only vendor who offers such complete mobile OS support. As we have stated above, SugarSync is not just about backing up your data to secure online storage centers, but giving you anytime, anywhere, any device access to it. You can access your music via iTunes while at work if you want to; access your files from any smartphone; and naturally you can either sync a computer from anywhere or even just access the data from a web browser on an internet connected PC of some kind. The options are just about endless, and that seems to be what the company wants! So if you have a lot of devices you want to synchronize or really would take advantage of the easy ability to share photos, files, etc, then SugarSync may well be the best online storage choice for you. OK, now that we have seen the best side of SugarSync, what are some things you may find they fall short in? Versioning only goes back 5 versions (but isn’t 5 really enough?). SugarSync is becoming really popular as more people learn of the flexibility offered with unlimited device synchronization and the ease of sharing photos and other documents. If you have only one computer then you might be enticed by the comparatively low price of the basic service which may have adequate storage limits for your needs. 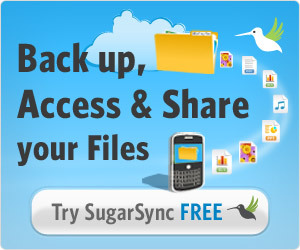 Start Backing Up Right Now With SugarSync!